Can you believe it? It’s THURSDAY already. And of course that means it’s time for another Create with Connie and Mary Thursday Challenge! This sketch might be a little challenging to you! I had used another card I made. Now the problem is…when I do that, I have THAT card in my head and it can be difficult for me do a different card! What can I say! I do like the way this turned out though even though it is so different from the other one I made! Stamp HAPPY using Bermuda Bay and Birthday using Blackberry Bliss. Cut three different prints from the Boho dsp – 7/8 x 1 3/4, cut into banners, layer, add behind the Very Vanilla panel then add to card front. Stamp balloon string on card using Delightful Dijon. 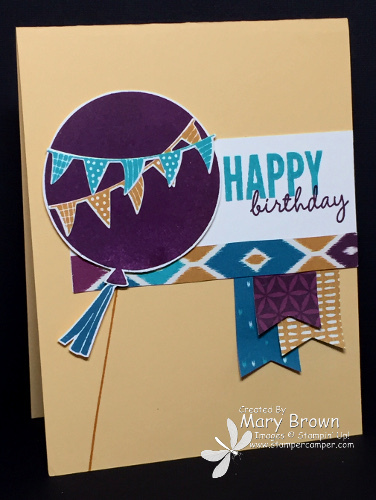 Stamp Balloon on Very Vanilla using Blackberry Bliss, cut out, stamp the flag using Island Indigo, cut out, stamp banner using Delightful Dijon and Bermuda Bay, cut them out, layer everything and add using dimensionals. The AUGUST 15 Mini Session is now OPEN!!! WOO HOOO! So, do you want to have access to some GREAT ideas using products from the new catalog? And then later on get a GREAT idea for a ‘Howl-o-ween’ card set? Check it out! All FIVE projects are available once the mini collection opens so you immediately have all projects (and tutorials) right there at your fingertips. Wow…so what is this going to cost? Only $8.95! We we went LIVE yesterday (8/19) and you will get ALL 5 ideas right away…no waiting! So head over to Create with Connie and Mary to sign up now! Don’t forget to check out what the rest of the design team! 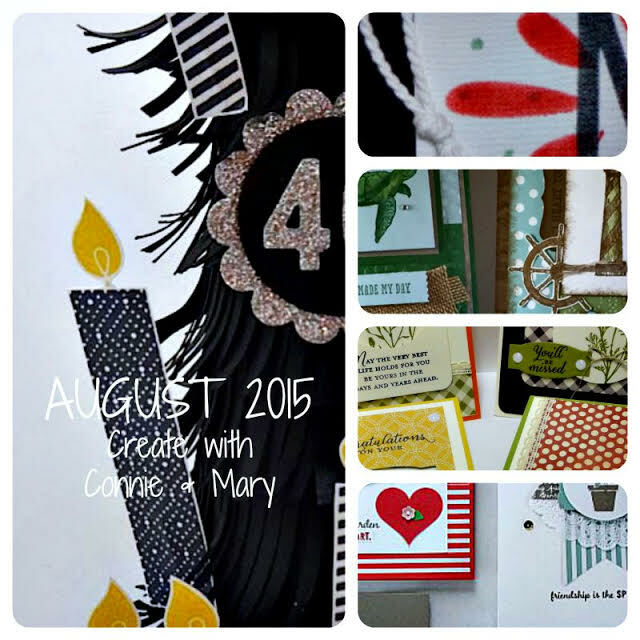 This entry was posted in Create with Connie and Mary and tagged Celebrate Today. Bookmark the permalink. The balloon framelit is a perfect fit for this sketch! Love the use of the Boho DSP too! I love the colors and dsp you used, Mary. The balloon is just perfect for the sketch also! What a fun celebration card! I would have never thought of pairing So Saffron with that color combo but it works beautifully! I love this stamp (although mine is somewhat neglected)…and I love the double banners over the balloon that you did. Great card!! What a beautiful birthday card! I never thought a balloon could look so elegant! Great idea to use So Saffron for the base – it works so well with these colors! The patterns of this paper look great together in these small quantities! Very fun!